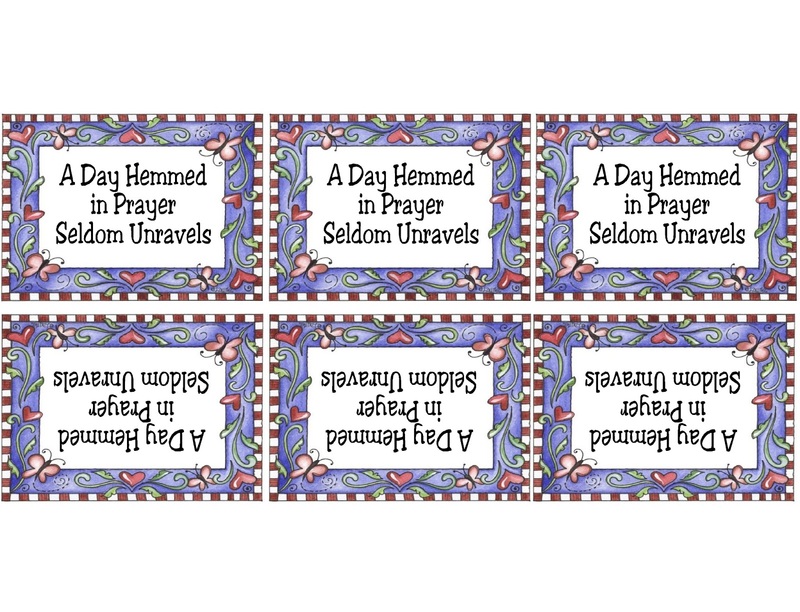 "A Day Hemmed in Prayer Seldom Unravels". 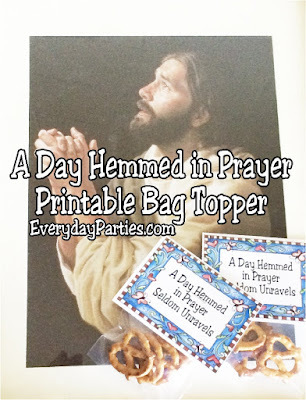 This printable bag topper is perfect for your church lesson handout on prayer. Simply fill with pretzels and read the enclosed story for a great object lesson and take away. Today, I taught a lesson at church on prayer. I think it's one of the most important and easiest things we can do when life goes wrong, but like the ancient Israelites and Moses/ fiery brass serpent, it's so easy that we think it won't work. In about 610 AD an Alpine Monk decided to make use of the pieces of dough left over from baking bread. The monk formed them into thin strips folded into a looped twist to represent the folded arms of children in prayer. 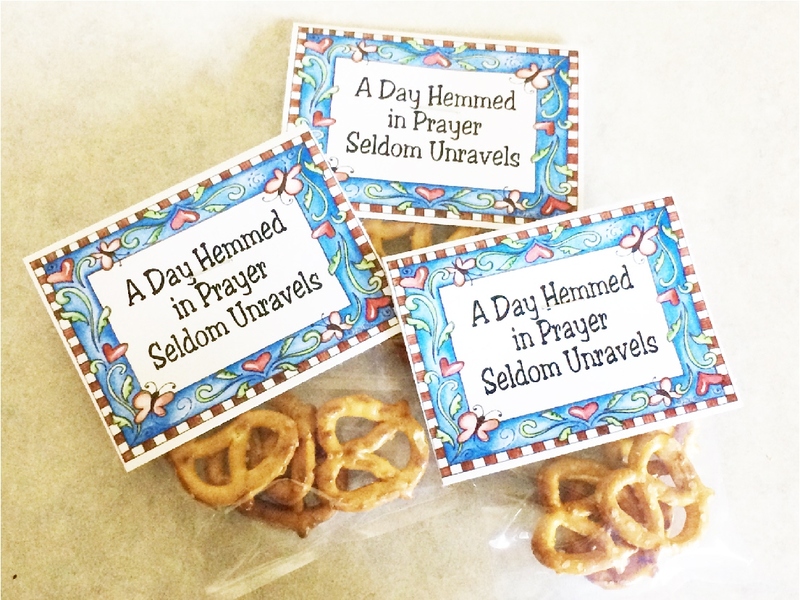 This treat was given to the children as they learned their prayers. They began calling the treat "Pretiola" which is Latin for "little reward." The secret to making great pretzels is not only in the baking but also in the shaping. We, like pretzels are made from the best ingredients, by the best hands available, the hands of a loving Heavenly Father. Have you ever seen a broken pretzel, or one that's lost it's shape? We too, can lose our shape when we don't pray always to keep our spirituality intact. Even in the midst of the trials of life, we must remember to call on the Lord. 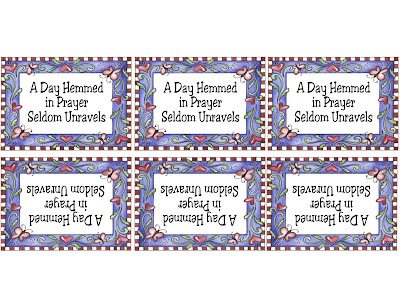 Our "Pretiola" or "little rewards" are the blessings we receive from prayer. 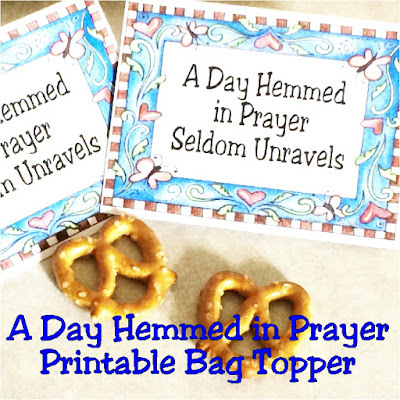 Every time you see a pretzel, remember prayer and check to see if your arms are often folded in prayer, and have not lost their shape." I filled each of the bags with 4-5 mini pretzels, then stapled the bag topper on top. The topper has a beautiful butterfly and heart frame from a PC Crafter artist, and reads "A Day Hemmed in Prayer Seldom Unravels". If you would like to use the handout, please feel free to click and save the JPG picture file below. Print out on to cardstock and hand out to your class members with love. 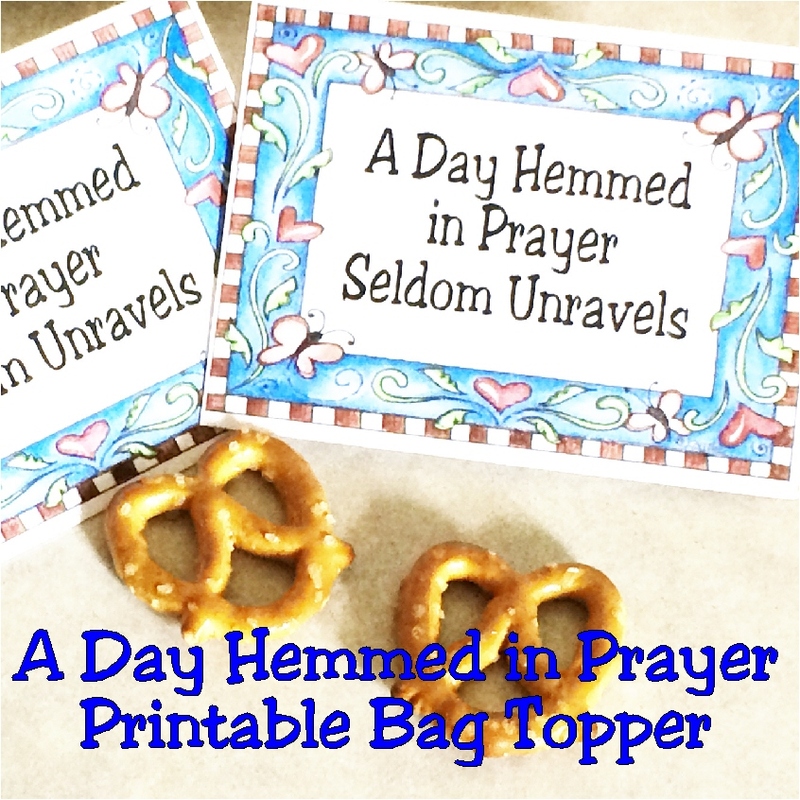 This is day 4 of our 30 days of Summer Free Printables. Be sure to check out all 30 days!